London Olympics protests: What’s behind the shocking suppression of free speech at U.S. political conventions and the Olympic Games? What’s behind the shocking suppression of free speech at U.S. political conventions and the London Games? 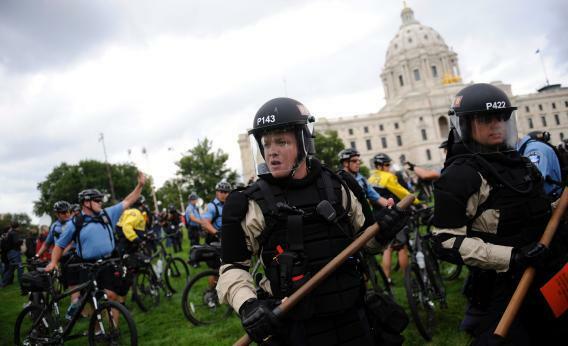 Police respond to a protest rally at the 2008 GOP convention in St. Paul, Minn. The restriction of free speech will be at a high point during this year’s convention in Tampa, Fla., as well as during the London Olympics. Photo by Eric Thayer/Getty Images. Remember back when large public events were also the locus of large public protest? As we stare down the barrel of the Olympic Games and the two national political conventions this summer, it’s fair to say that free speech has been reduced to a mere wheeze, both in the United Kingdom and here in the USA. What are truly interesting are the differences between the two: The British are buying up free speech and the Americans are zoning it out. As the New York Times reports this week, speech- and protest-related regulation surrounding the GOP convention requires “a permit for groups of 50 or more to gather in parks; sets a limit of 90 minutes on parades; and bans an array of items, including glass bottles, aerosol cans and pieces of rope longer than six feet.” While water guns will not be permitted at protests, those with concealed weapons permits will be allowed to carry real guns, so as not to interfere with their constitutional rights. The AP reports that as of July 6, only three groups have signed up to protest or parade and that there are still 28 open slots during the four-day convention. The Times also reports that 1,000 local officers will join 3,000 officers brought in from other cities to police the protests. Gas masks have been purchased for these officers and security cameras have been installed throughout downtown Tampa. $13.6 million has been laid out so far for bicycles, 13 electric all-terrain vehicles, and an armored truck. Tampa has also been completely reconfigured so that, during the convention, streets are no longer streets and sidewalks are no longer sidewalks. The urgency lies in ferrying thousands of convention-goers along safe vectors from one corporate space to another, from their hotels to the Tampa Bay Times Forum. Indeed, the fear seems to be principally that nothing go amiss when Tampa hosts the “world’s largest cocktail party” at Tropicana Field in St. Petersburg. When real sidewalks and streets are being closed so that real people can’t speak for fear of interrupting the good times at Tropicana Field, you have to wonder a little. The Framers believed in a free marketplace of ideas, not in the free market of brand names. Which brings us rather nicely to the London Olympics, where—aside from the usual clamping down on protest or even potential protest—we’re seeing unprecedented restrictions on speech having anything to do with, erm, the Olympics. There are creepy new restrictions on journalists, with even nonsportswriters being told they should sign up with authorities. Then there’s the London Olympic Games and Paralympics Games Act 2006. The law was originally aimed at preventing “over-commercialization” of the games, but it seems to have unloosed something of a Pandora’s box of speech-suppression. Provisions triggering worries for protesters include sections regulating use of the Olympic symbol “in respect of advertising of any kind including in particular—(a) advertising of a non-commercial nature, and (b) announcements or notices of any kind.” The law further seems to authorize a “constable or enforcement officer” to “enter land or premises” where they believe such material is being produced. It also permits that such materials may be destroyed, and for the use of “reasonable force” to do so. These laws were designed to address what is known as “ambush marketing,” wherein a third party tries to associate itself with a sporting event, denying official sponsors some of the value of their own “official” designation. It’s hardly a new problem and it’s a significant issue in the realm of intellectual property law, but London seems to have taken its response to Orwellian heights. Creepily enough, the law is being enforced by (wait for it) the Olympic Deliverance Authority, which has brand enforcers roaming the green hills of Great Britain to halt abuse of the five rings by the unauthorized. Violators can be fined in amounts up to $30,000. So far a London café has been forced to remove five offending bagels from its windows, as has a butcher who had the temerity to do the same with sausage links. Spectators have been warned that to risk wearing a garment adorned with the Pepsi logo may result in being banished from game venues and that nobody but McDonald’s can sell French fries at any Olympic concession stand. An old lady got tagged for sewing the five rings onto a mini doll sweater. Don’t photograph your Pepsi bottle. But it’s not just the Olympic rings that are being protected; it’s also Olympic words. As Nick Cohen recently observed, the “government has told the courts they may wish to take particular account of anyone using two or more words from what it calls ‘List A.’ ” Those words: Games, Two Thousand and Twelve, 2012, and twenty twelve. And woe betide anyone who takes a word from List A and marries it with one or more words from “List B”: Gold, Silver, Bronze, London, medals, sponsors, summer. Oh, and there’s more. Spectators have been warned they may not “broadcast or publish video and/or sound recordings, including on social networking websites and the Internet,” making uploading your video to your Facebook page a suspect activity. Be careful with your links to the official Olympic website as well. But these events must be more than just clean staging areas for corporate fabulosity. Protesters, participants, and citizens aren’t parasites or background noise. Addressing threats of terror or real violence is one thing. Treating all speech and protest and media as inherently dangerous and violent is something entirely different. Brandishing the wrong sign in the wrong place isn’t protest, and brandishing the wrong French fry in the right place isn’t dangerous. Corporate cleanliness is just a short hop from corporate godliness, and by then it’s much too late for speech. Read the rest of Slate’s coverage of the London Olympics.